Although sustainable investing is not the same as impact investing and the growth dynamics could be very different, few sectors have sustained growth rates above 50% per year.21 In order for the impact investment sector to realize its potential, mainstream asset owners and asset managers will need to begin to allocate a portion of their portfolios to the sector. There seems to be powerful but latent demand among retail investors for impact investments. But many investors are waiting for their clients to ask for it. My guess is if you build it, they will come. Along with aggressive growth expectations, interest in socially conscious investment strategies is indeed growing. 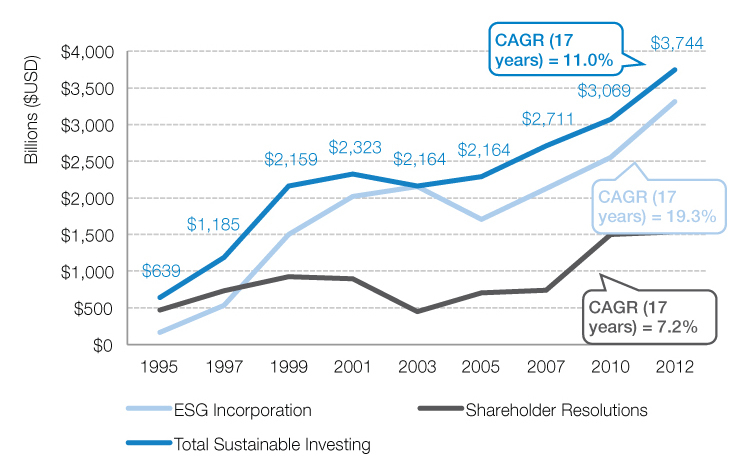 The US SIF Foundation’s 2012 Report on Sustainable and Responsible Investing Trends revealed that client demand is the number one reason why more money managers are incorporating ESG criteria into their investments (see Figure 6). According to the same report, 11.3% of assets under management in the US were engaged in sustainable and responsible investing practices in 2012.22 Similarly, the United Nations Principles for Responsible Investment (UNPRI) initiative reports that its signatories hold approximately 15% of the world’s investable assets.23 Although as Section 2.2 described, sustainable investing and responsible investing are not the same as impact investing, trends in these markets can provide indications of the potential trends for impact investing. 16 Jessica Freireich and Katherine Fulton (2009): Investing for Social and Environmental Impact, Monitor Institute. 17 Nick O’Donohoe, Christina Leijonhufvud, Yasemin Saltuk, Antony Bugg-Levine, and Margot Brandenburg (2010): Impact Investments: An Emerging Asset Class, J.P. Morgan, Rockefeller Foundation, and the Global Impact Investing Network. 18 Calvert Foundation (2012), Gateways to Impact. 19 According to Perspectives on Progress: The Impact Investor Survey (J.P. Morgan and the Global Impact Investing Network), 51 impact investment funds each expect to raise an average of US$ 112 million in 2013 (median of $US 60 million); given there are approximately 250 global impact investing funds, a crude estimate of the market size is likely between US$ 15 and US $28 billion. This is likely a low estimate given it only includes certain asset classes (e.g. venture capital, private equity, etc.) and excludes others (e.g. green bonds, infrastructure, etc.). Furthermore, CGAP estimates that in 2011 cross-border funders committed at least US$ 25 billion to microfinance and financial services to the poor (see: Current Trends in Cross-Border Funding for Microfinance (December 2012), CGAP). Although not all of these investments would be considering impact investments, it confirms that an existing market size of US$ 25 billion may be understated. 20 The impact investment sector is starting from a smaller base so it may be possible for it to achieve the implied growth rate. 21 Since 2003, social network game development grew by 134% per year; e-book publishing by 88% per year; social networking sites by 74% per year; and online fashion sample sales by 56% per year. Source: Top 10 Fastest Growing Industries (April 2013): IBISWorld. 22 US SIF Foundation (2012): Report on Sustainable and Responsible Investing Trends in the United States. 23 UN Principles for Responsible Investment (UNPRI) (April, 2013): PRI Fact Sheet – Key Achievements, http://www.unpri.org/news/pri-fact-sheet.